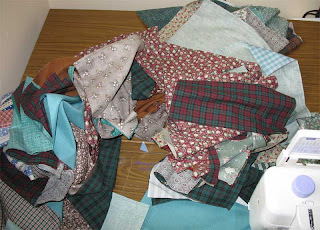 Well there was this, a checkerboard of leftover scraps from another quilt. And yet more scraps came to light. 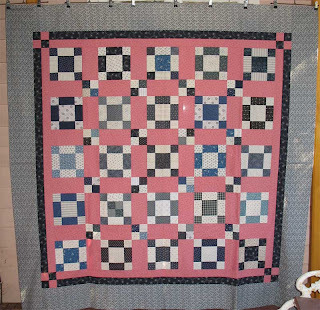 And my friend Suzy saw the checkerboard and said 'Why don't you make a doll quilt?' And that's all it took. Once it was in one piece I found a remnant for the backing, and a scrap of cotton batting Exactly the right size, and basted it ready for hand quilting. 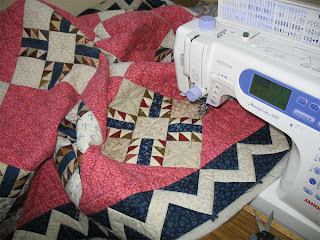 I have been jealous of all those other bloggers, like Mary and Tonya, making small hand-quilted quilts. So now I have one of my own to stitch on while I watch The US Open each night. Even the fact that I emptied three bobbins of scrap thread piecing it, and the dregs of two reels of thread basting it, pleases me inordinately. What a scrappy project from start to finish. 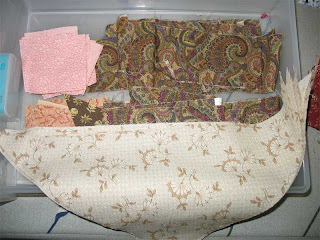 I even have a partial reel of quilting thread to use up on it. I am trying so hard to not obsess over whether it's perfectly pieced and the colours are balanced and the edges straight. I really want this to look like someone cobbled it together for her child, in between chores. Well I did it between chores, but it's for Me. 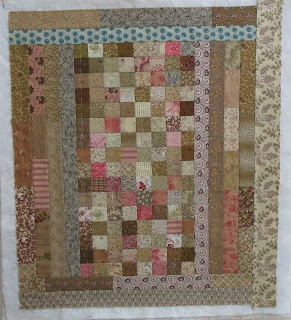 The blue bit just demanded to be there, and while my sensible side wailed 'But it's a pink and brown quilt!' some other voice said 'Just use it.' 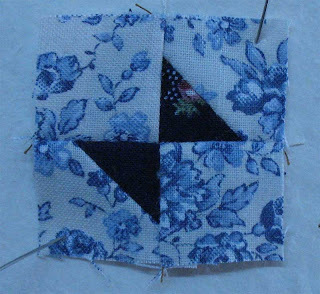 I do remember making patchwork for my daughter's dolls, sewing bits together on the machine while she stood next to me and ordered 'Put that there. Not there! I want it like this...' Not only was my real child bossy and opinionated, it seems my inner child is too. Mereth and I have signed up for Tonya's online class. Should be great fun. I'm looking to make something a bit different from my usual traditional quilts, and it should be fun to do it as an online course. I'm terrible in workshops; I don't like sewing without my usual setup, and I always want the bit of fabric I didn't bring, and I get distracted way too easily. This should be fun. To start with we have to research our favourite quilts, find out just why we like them so much; should be a thought-provoking exercise. My rearranging is making it hard to sew, so there isn't a lot of progress on anything to report. Except an awful lot of cleaning and dusting and boring stuff like that. The bulb in my machine flickered and died last week, and of course it's not a conventional machine globe so I couldn't replace it with one of my spares. I didn't get over to the sewing machine shop until Tuesday, which meant I could sew, but wouldn't be able to see what I was doing or properly enjoy it. 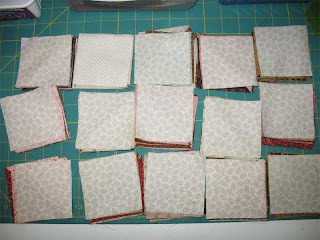 For mindless sewing I grabbed my box of 10.5" squares and sewed them all into pairs, ready for the next time I want a pieced backing. Now to press them and sew most of them into four-patches.. I was rummaging in the orphan drawer this afternoon and found two of these blocks. 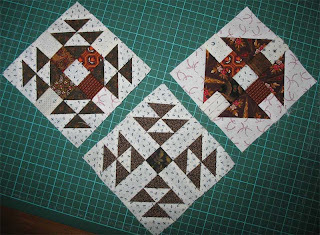 I really liked piecing them, and I have another one cut out; I think I just didn't have enough time to do exacting blocks when I started them. The problem now is, I can't remember how I did them. My organisational skills let me down there! I suppose I can measure the size of the cut pieces and hope that it's accurate. They'll be strange sizes, because this is a 12" block, and they aren't equal divisions along the edge. Oh well, it will be a challenge, when I get round to doing it. 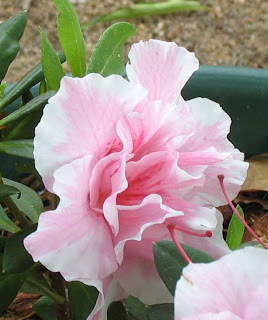 I'm enjoying my garden, the azaleas are lovely. I think they are my favourite flower after roses. This one is called Candlelight, I love the pale pink and white, so pretty. I've been struggling to write this post all day, and things kept interrupting. And I still have homework to do for Tonya. Guess I'd better get busy feeding the family, and then do my quilt study. Dearie me, I've been a busy bee this weekend. There has been lots of mindless quilting, which is always a good thing, it means this quilt is getting closer to completion, and that will make me very happy indeed. I have also listed lots of spare fabric and books and wool on Ebay, so that will clear out a pile of unloved stuff within the week. 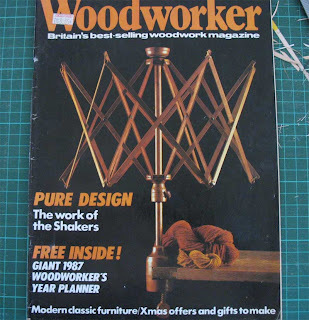 And I contemplated the pile of woodworking magazines, which are from the '80s and also among my treasured things, and decided there were just toooo many boxes and they needed to be rationalised. Of course I can't get rid of them, not when I want to make things like this one day; it's a swift, and I need one badly to skein the wool that I intend spinning. You know, when I have time. I hate ripping pages out of magazines, I had the messy edges. So with these I got cunning and cut the spine off them first. 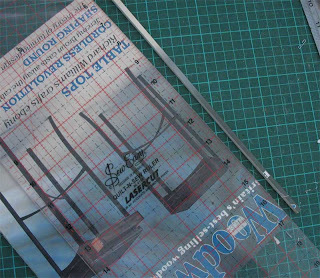 I used an old rotary cutter, and made several passes until Ihad cut through the whole magazine. This is the perfect opportunity to slip and cut yourself badly, so it pays to go slow. I started the cut slightly in from the edge, and when I had all the rest of the spine separated I ran the cutter backwards to sever that first bit. It doesn't work to cut fabric backwards, but this worked fine. Then it was simply a matter of flipping the pages over and deciding what to keep; anything worthwhile went onto the first pile, the rubbish went onto the pile further away. I am building up a stack of pages, and one night I will put them all into plastic sleeves and store them in a ring-binder. It has really slimmed down the stack, there are a lot of ads and product reviews for defunct machinery in these issues, so most of the magazines I saved only 20% of the pages. 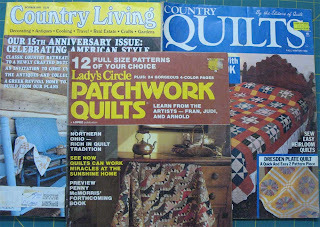 It has worked so well that I will tackle my quilting mags next. I bet you thought I'd dealt with them already! I'm all talk. I used to work in a furniture factory, and I am capable of making simple things. These are two that have survived. 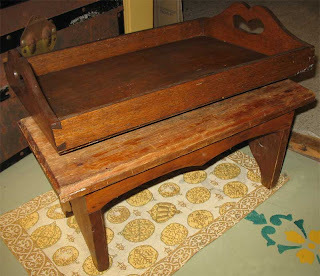 The tray is just as good as when I made it in 1991, but the stool needs refinishing. Some nameless children covered the top in stickers, which have worn off and left disgusting residues; it must be 15 years old at least. It lives in my pantry, and I use it every day to reach things on the top shelf. 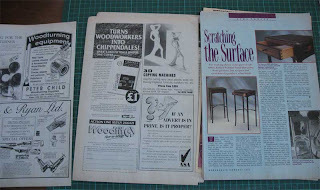 Mereth will remember another set of stools we made 27 years ago; no-one ever went to use them without being warned 'Careful! They can tip over....AAAAGGHHH, I Told you to be Careful!' So finally they were thrown away; they looked lovely, Baltic pine and all, but were so unstable. It's taking me a while to get back into things after my weekend away. I seem to have lost momentum, and I've been doing lots of little unrelated jobs instead of tackling any of the huge ones. Still, I've kept moving, which is half the struggle; things are being accomplished. I found another basket of strips and offcuts from a pink and brown Roman Stripe I did a few years ago. I should have cut them up as soon as I finished the top, but of course they were just hidden in a drawer to deal with later. This piece is around 8" x 17" and will fit into my Orphan block quilt somehow. Another basket empty. Then there is another sock finish. This is just lovely to wear, but now I have to knit the other one. I gritted my teeth and cast on last night, and managed to finish the toe before bedtime, so it's all ready for several nights of mindless knitting. I seem to have adjusted to the splitty wool, it's not as difficult as it was, so I should enjoy finishing this one and wearing it in the small amount of cold weather left to us. We've had a cold snap this week, and soft rain, just my sort of weather. 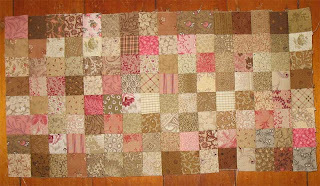 This is the copy of the antique quilt that Mereth referred to in her August 5th post. Jenni at Fairybread Quilts should love the pink setting squares; she's just topped up her stash with new pink fabrics. 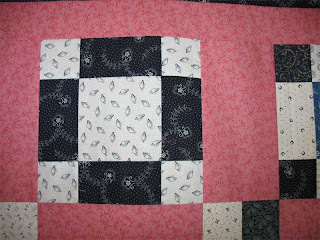 In the original quilt the setting material was closer to a red, from what I could see of the unfaded seam allowances, but I had nothing approaching that colour so I went with pink. It needs some more quilting, so I have been trying to get that completed before I pack up my sewing room for a major reshuffle. Sometimes I just love moving furniture around, but my back's aching at the thought of moving my sewing desk. Still, it will be a great new set-up when I'm finished. 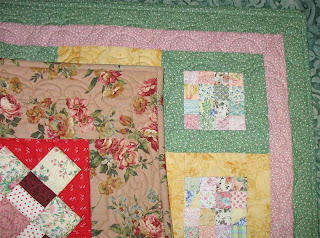 I was good today, I made the bindings for two small quilts and got them finished at last. I'm working my way through the pile slowly but steadily. Four quilts bound in a week is pretty good going. 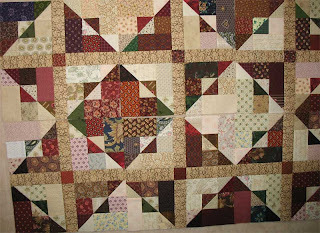 Then I finished the quilting on a small wholecloth, and washed it. It's drying on the rack now, hopefully it will be dry by tomorrow afternoon, when I leave to teach a workshop in the town where my DD lives. 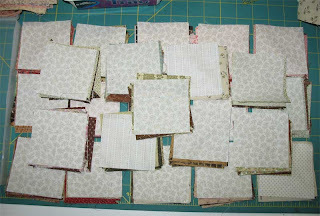 I'll be teaching 15 ladies how to mark and quilt their own little wholecloth quilts. Should be fun. I get to stay with DD, so we will have a nice get-together over the two days I'll be there. This is a little wholecloth I made for a magazine article; it's hanging in the LQS. And just when I thought I'd unearthed all my old projects, there's this. I started this in 1994, and it's been slow going. I'm not an applique person, it's not that I don't like it, or can't do it, it's just that it's never captured my attention for very long. I am doing these with the needleturn method, and while I like it there always seem to be other things that are more interesting. Maybe I can treat this like a BOM and do the other 5 blocks between now and Christmas. The pattens are in the box, and the material is all basted to the background and ready to start; I'll have to bribe myself to work on these because I do like the finished effect and it will be lovely to quilt. The impromptu sashing is the binding strips I'd just cut for the other quilt, but I have plenty of material if I want to do the sashing with it. 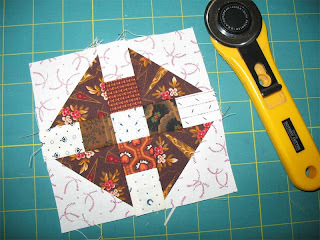 Meredith from Quilt Threads mentioned on her blog that she didn't particularly like the new format of Quilters Newsletter. I haven't even seen a copy yet, it will take a while to filter through to Newsagents here. But it made me realise that I haven't bought a quilt magazine for a very long time. The highlight of my existence used to be getting a new quilt magazine, it was such a red letter day. Coffee, chocolate biscuits, comfy chair, DO NOT DISTURB ME! There is just too much on offer these days, and my tastes are quite defined, and I have so many books and magazines already. 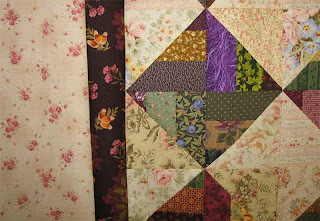 Plus there is a never-ending stream of quilts and images on-line. Magazines don't hold the same high place in my life any more. 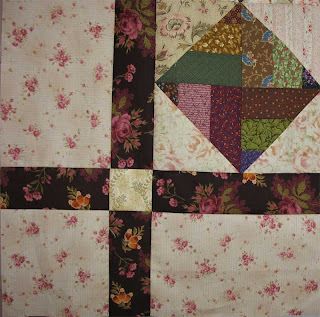 I still love the old Ladies Circle Patchwork Quilts, and Country Quilts. They are such old friends that I know every caption to every photo. 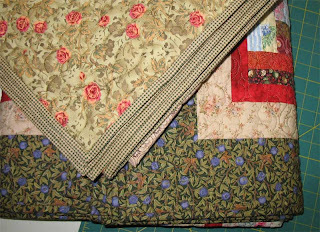 I also cherish my old Country Living magazines, for the quilts that figured in the interior shots. Priceless now, seeing that tastes have changed and there isn't the same emphasis on quilts as decoration. I would sacrifice all my modern magazines in order to hang on to my old ones. I have forced myself to stop work each afternoon and make a pot of tea, which I have on the deck in the late winter sunshine. I make sure I use my good English china teacups, and have a dainty biscuit or two. It's a very soothing ritual, and I am working my way through a pile of recent magazines and books, deciding what to keep and what to give away. There's not a lot on the To Keep pile. Which is a good thing; someone will find them at Goodwill and be glad to have them. I finished the binding on two quilts this weekend, which is quite an achievement. I made the bindings late last year, so it's only taken me months to actually sew them on. 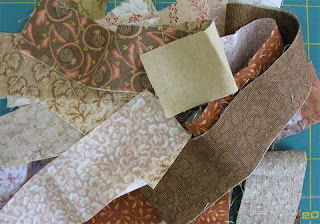 I may even cut out some more bindings this afternoon, and package them with the quilts so that I can keep up the good work of finishing, whenever I have a spare moment. I have the wrong mindset; I feel a huge thrill of accomplishment when I finish a top, but relatively little excitement when I finish the binding and it's actually usable. I have my priorities wrong. I think it's because finishing the top gives me permission to start something else, whereas finishing the quilt just means I can put it on a bed or on the pile, give it to someone or send it off to a shop. I'll have to work on changing that. 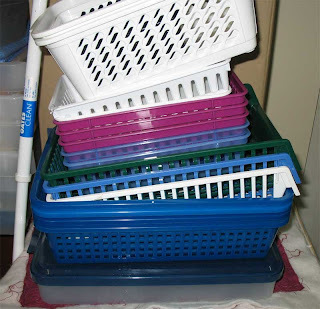 See how many containers I have emptied? They held remainders of projects, (remember my problem with over-cutting!) so I sewed up all the strips, recut them into slices and made 4-patches, or cut them into half-square triangles and bagged them ready to sew. It's been fiddly work, but I kept at it all week, and there is progress at last. It didn't help that I sliced into the top of one finger early on in the proceedings; I've been vewwy, vewwy careful since then. I could show you a picture, but Mereth went 'Ewww!' when I sent it to her, so I will spare you the gory details. My drawer of orphan blocks is crammed full, and I think I will rummage around in that and see what comes to light. 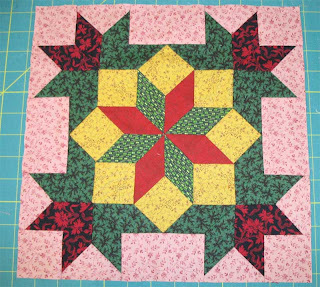 Maybe my 25 extra blocks will make a nice border to pull all the orphans together. I have nearly finished investigating all the containers in my sewing room, but I wasn't prepared for the contents of this latest lot. 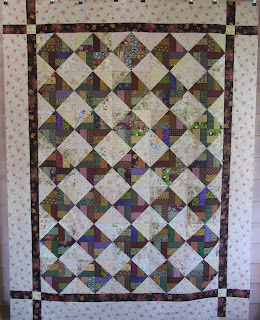 I started this quilt about 7 years ago, I rather think it was in the New Jersey Quilts book. Seeing I can't put my hands on that book right now, here's a mock-up in EQ6. The block is called Jacks On Six in BlockBase; weird name. 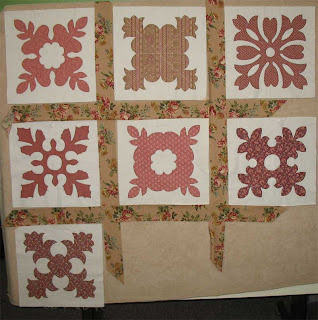 I wanted it big enough for our queen bed, 41 blocks, and I wanted it straight away, so I worked out a cutting plan and a system for piecing it quickly and away I went. I cut and I cut and I cut. I sewed and sewed and sewed. 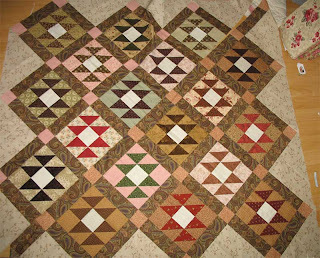 This would be 18 blocks with sashing and setting triangles. And here's where I came unstuck. 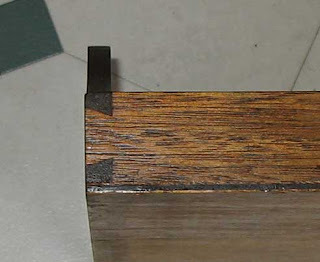 The bottom half has darker corner posts between the sashing strips than the top half. Also some of the blocks have darker backgrounds. I simply couldn't decide which I liked better. 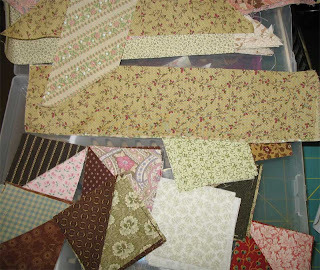 I kept sewing and cutting out blocks from different fabrics, desperately trying to make a decision. Mereth came for a visit and was appalled! Impressed by my speed and superb organisational skills, but nonetheless aghast that I had cut up so much fabric for one quilt. I took no notice, I knew what I was doing. Right up until I got heartily sick of the whole thing and packed it away in four containers and put them in three different places and never went back to even look at it until now. I must have been deranged, high on fabric fumes or something. Here's what was in the containers. 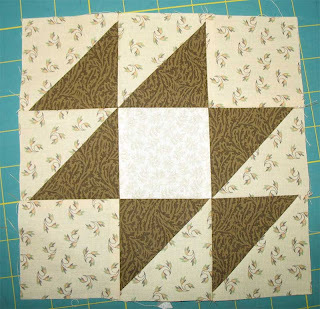 Pieced strips for half-square triangles using Nancy Martin's method. That's the pieces for 15 blocks. 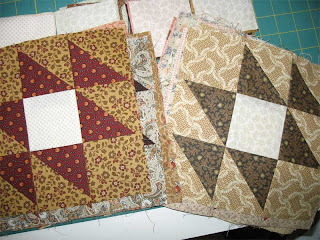 That's 23 blocks already pieced. I spent an hour or two this afternoon cutting the rest of the half-square triangles, finding all the pieces and putting together enough bits for 25 blocks. I pieced one to see how long it would take. 5 minutes. 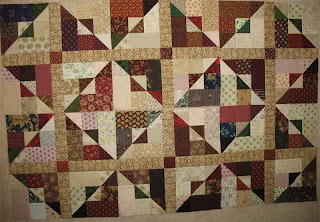 Incidentally, I like the top half of the pieced section better, with the lighter blocks and corner posts. It was my original choice, before I made everything too complicated. Mereth was right to shake her head and wonder at my sanity. Now can someone please explain what I am going to do with 66 of these damn things? I get distracted so easily.... I was making Monkey Wrench blocks wasn't I? Don't know where these other two came from, or why I'm suddenly making 1" half-square triangles. BlockBase calls the block on the top left Crown of Thorns, the one at top right Double Wrench, and the one below that Handy Andy. They certainly takes a lot longer than the original block, so I need to be stern with myself and get back to the original idea. These two will be ring-ins, I absolutely don't have the time to muck about with such tiny pieces! Pay Attention, Self! In between work chores I have been clearing out bookcases and whittling down the library. The last bookcase to be tackled is 5' wide, 9' tall and packed absolutely full. I am astonished at how much I could bear to part with, Goodwill is going to get a huge donation of books tomorrow. But I really doubt that I will ever want to read Robert Ludlum again, or those thick conspiracy theory novels that were so popular in the '90s. I had multiples of a lot of my favourite books; when I go to second-hand bookstores I buy my favourites again if I find a copy in better condition. The sensible thing is then to chuck the grotty previous copy, but I don't seem to get to that step. I have done it now though. I discovered books I'd been searching for, and dusted everything, and put it all in order, so I'm happy with my days work. Now I'm off to have supper and knit on my sock for a while. My new supper fad is pumpernickel bread. It tastes like a cigar would, or silage, but very nice with cream cheese. Yesterday I did my good deed for the week and drove my daughter's car out to her place, about 3 hours away. On her last visit home some little weevil broke the window and snatched her things from inside, and she had to go home with a friend while repairs were arranged. It was a lovely drive out, on a beautiful mild, sunny day. I spent three hours with my darling girl, and we visited the botanic gardens as a little outing. 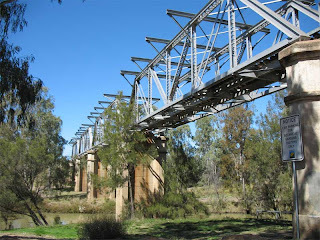 The railway bridge spans the entrance to the gardens, and that's the Nogoa river. It's still very dry out there, but most of the gardens are still alive. 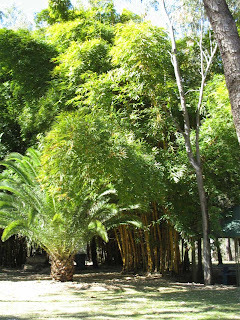 This bamboo seems to survive no matter what. 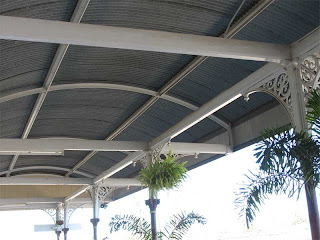 I love the curved verandah roof of the railway station. I then caught the bus back to town. It was a nightmare trip. There was a fatal accident that closed the highway for three hours, and it's rather sobering to be waiting by a crash scene for that amount of time, while the emergency vehicles and helicopters ferry out the injured. The behaviour of some of the passengers was disgusting, as if the biggest tragedy was the delay to their plans. Some people are so shallow. 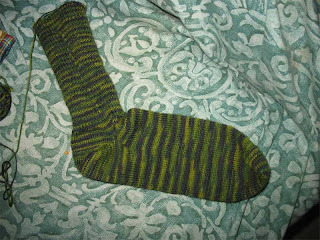 I knitted a sock to keep me busy, and got the whole foot done so I at least achieved something. I walked home from the bus station, as it's only a few blocks, had some tea and slept for 11 hours. My long workdays are catching up with me, I was sooo tired. 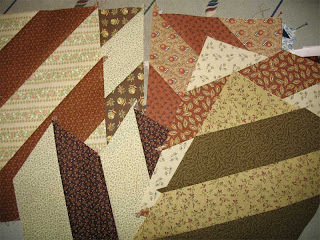 I feel much better today, and have already sewed together 6 blocks of a quilt I started in March. Sewing puts my world to rights. Meggie in one of her posts told about hearing a woman's life story in the dentist's waiting room. I love collecting strange comments, I adore overhearing conversations. Recently when I was trying on clothes in a boutique the sales assistant came past asking if anyone needed help. 'I'm not having any luck at all with these pants' sighed the woman in the cubicle next to mine. 'Do you need another size?' the assistant asked. I had the most amazing mental images after this revelation, including a harassed woman being prodded by a fork with all the tines bent into curlicues. I know what she meant, but I had NO desire to picture the shortcomings of her crotch either. In all my born days I don't think I would ever form that sentence in my mind and say it to another person. This is a top I discovered and decided to photograph for the record. 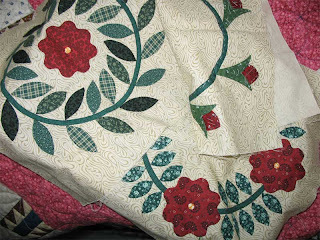 It's about 5 years old, and will go into the Waiting To Be Quilted pile. One of these days I'm going to actually count the tops, but not yet. It will shock me. 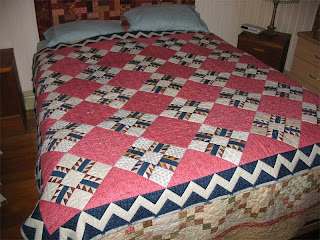 I do love pink and navy, went through quite a phase of pink and navy quilts. So antique. I have had one of those busy weeks where I worked madly for days and it all had to be finished and posted on Friday. I made it to the Post Office at 2 minutes to 5, with DS lugging in all the parcels while the mail van waited with it's engine running. I couldn't have cut it any finer, but it all got away on time and now I get to have two days off. I refuse to do any more work this weekend, except for a few minor chores. I deserve some time off. Amazingly, when I'm so busy filling orders I often get a lot of sewing done, as I have to wait around and tend to the printer, which is handily located in the sewing room. So I pulled out this project from last year, and made more of the blocks and put the border on. It still took a mammoth effort, but it has freed up another container and now I want to kit up something else and fill the box with pieces again. It's perpetual scrapping at it's best. The colour in the first photo is correct, the others are a bit greyed out. I MUST work out how to use the settings on my camera better, so I can correct things as I take the photos. I just never seem to have the time somehow. I like the border, it's just a bit unusual for me. I get sick of just putting the same sort of borders round things, so this was a nice little change, and added something to the overall look. Again, it's a large single bed size, so I'm being good about limiting the quilts to more manageable sizes. At night time I have been knitting on my socks. The pink pair are for a friend, so I had to start another pair for me straight away. I found this sock wool at Spotlight (cheap fabric chain) for only $3.99 a ball, and I loved the colours. 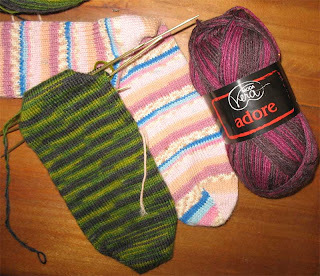 The magenta mix will be socks for DD. However, it's the most disgusting stuff to knit, I had to start the toe three times because the wool is so splitty and hard to see on the needles. I was having such a dreadful time with it I seriously thought of chucking it away! Then I tried the thing on. It's sooo lovely to wear that I have decided to persevere, and will even struggle through the socks for DD, but I don't know if I will get any more. It's not a pleasure to knit these things, with such a fine gauge and so many difficulties. I am getting an Ott Light, and a magnifier, so maybe they will at least let me see what I am doing. But it's definitely not the sort of mindless knitting to do while watching TV. It takes concentration. And finally, one of my pictures from my stay on the farm at Bell. 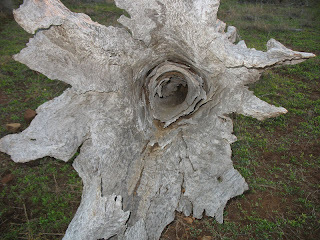 An old tree stump had been weathered into this art form over many years. It's looks like a grotesque flower.